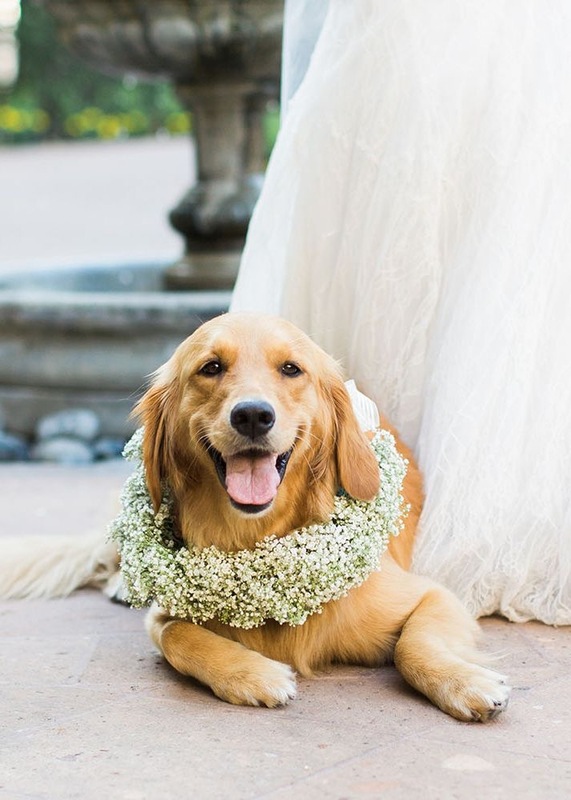 Including your pup in your wedding day can be one of the most rewarding or stressful experiences! Some of the factors in this include how well your dog is trained, the age of your dog, if you have someone specifically handling your dog throughout the day, and obviously whether or not your venue is fully on board with it. Checking with your venue is an absolute must. This is not a time when you want to ask for forgiveness over permission. If pets are not allowed on-site, your venue may charge you an extra fee, not allow the dog on site, and even possibly not allow you to continue decorating or getting ready until the dog is off of the property completely. Making sure it's ok will save you time, a headache, and maybe even money, especially if you've offered to pay a family member, friend, or dog handler for their pup-watching task. If your venue gives you the go-ahead, I highly recommend dubbing someone as your dog handler for the day. This way you can still have your pup around while getting your hair and makeup done, but someone else will be taking your pup outside to potty, feeding them, and making sure they don't get into mischief. You'll also have that person available to make sure your dog walks down the aisle at the correct time, if you're including your dog in the procession and recession. I also don't recommend making this person anyone who will be in the wedding party as they'll need their time to get ready too. Whether or not you have someone handling your furbaby for the day, a well-trained dog will make things much easier. Just imagine trying to get through your vows while your dog is barking at a squirrel or a person it isn't comfortable with and not listening to the commands to be quiet. Your guests may not want a dog jumping all over them and you definitely don't want a dog who tries to steal food off of tables! Training your dog yourself or taking them to classes will make a world of a difference. If you’re thinking about having them carry a basket with flowers or the rings down the aisle, then this is something you’ll definitely want to start practicing way in advance! 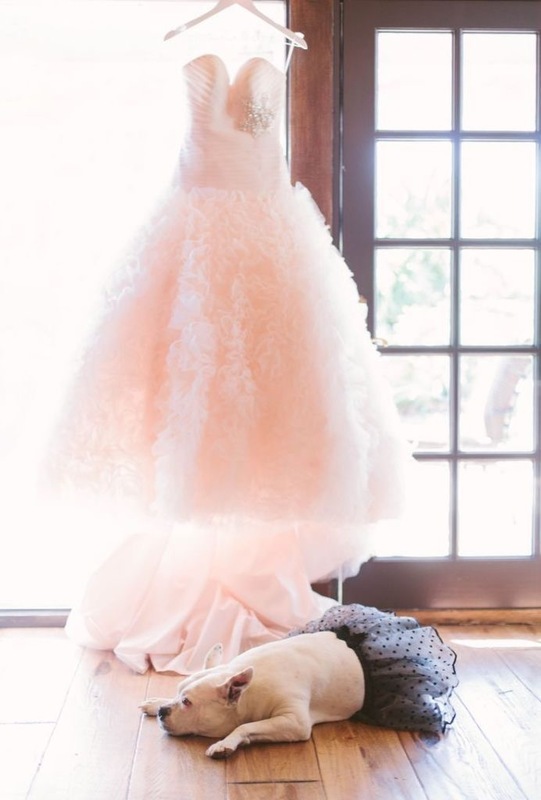 When including your dog in your wedding, you MUST get them groomed beforehand. One to two days before your wedding day would be your best bet, so that they smell and look as fresh as possible on your big day. All of your guests may LOVE dogs, but they may not be too thrilled when they show up dressed to the nines and then have a dirty, stinky pup rubbing up against them. Aside from a nice bath and brush, I would highly recommend cleaning your dogs teeth. Not only will their breath smell better when they greet all of your guests, but any pictures of them and their mouthes open would look better without a bunch of plaque showing! One great article I've found on doggy dental hygiene can be found here. It covers a multitude of ways to clean your dogs teeth! Last but not least, make sure your dog has a safe haven to hide out in. Some pups may be completely fine during the more calm ceremony, but be frightened of all the commotion at the reception. You’ll want to make sure they have a crate hidden in another room where they can hang out should they get to nervous later on. For reviews on great dog crates and beds, make sure to check out www.DogProductPicker.com! You’ll be able to read the pro’s and con’s of other peoples experiences with the products before you buy them.